Rose Witcher opened its doors in 1950. 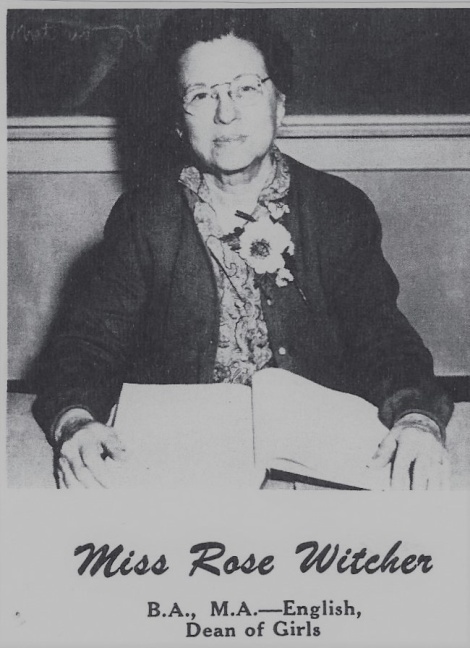 The school was named after the senior member of the El Reno faculty, Miss Rose Witcher. Rose Witcher was born October 17, 1885 at Herndon, MO to Jesse and Minnie Witcher. Miss Witcher began teaching in the El Reno School system in 1913 and remained until her retirement in May 1955. In addition to teaching English at the high school, she was principal of the El Reno High School from 1926 until 1935. She served as Dean of Girls from 1935 until her retirement. Which means, she served in this capacity for 20 years. In 1954 Miss Witcher was selected as the Teacher of the Year for the State of Oklahoma. It was reported that during her years of service in El Reno, Miss Witcher had been active in church and civic affairs. She had influenced the lives of thousands of boys and girls toward high ideals and better living during her years as a citizen of El Reno. Ill health forced her to retire in May 1955. She passed away November 1, 1973 at the age of 88 years. She was interred in the El Reno Cemetery. The El Reno City Council sold the major portion of Bronson Park to the Board of Education for use as a school site in July 1947. The new school building would be for the children living east of Rock Island, while Central School would provide for those living west of Rock Island. This kept the children from crossing the busy Rock Island Street to attend school. Rose Witcher School was built in 1949 and 1950 and it was named in honor of Miss Rose Witcher. The 170 school children and 6 teachers moved into the new building on March 27, 1950. Rose Witcher became the 1st – 2nd grade center in the 2008-2009 school year and has been a Great Expectations Model School since 2010.